Today I will discuss about Timer. It's very important part of microcontroller . Basically Timer is used to measuring time. Microcontroller performs time related operations using timer . As we need to measure the time of each falling edge of IR-Signal .In this tutorial we will use timer0 of pic18f2550 and we will use 8bit mode. You may use 16bit mode, but first time skip complexity. Both TMROL and TMROH registers works with 16bit mode. PIC 18f2550 microcontroller has 4 timer modules. Timer0,Timer1,Timer2 and Timer3 . 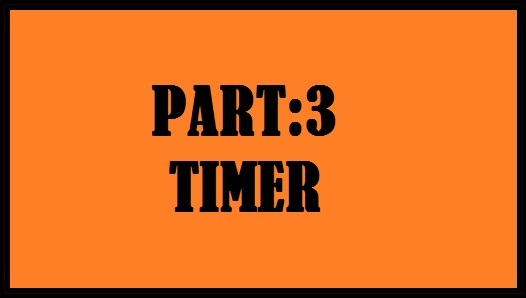 I will only describe about Timer0 and i will try to make it easy so that you can make it by yourself . 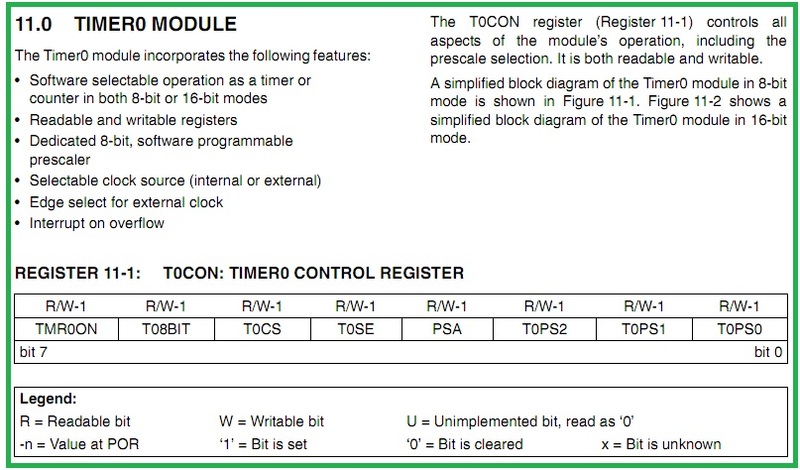 Generally Timer0 is controlled by T0CON register of pic18f2550 and TMR0L is Timer0 register low byte . In 16bit mode both TMR0L(8bit) and TMR0H(8bit) works. But in 8bit mode we can use only TMR0L. This timer0 register is incremented for each pulse comes to it and can count from 0 to 255 (0xFF). 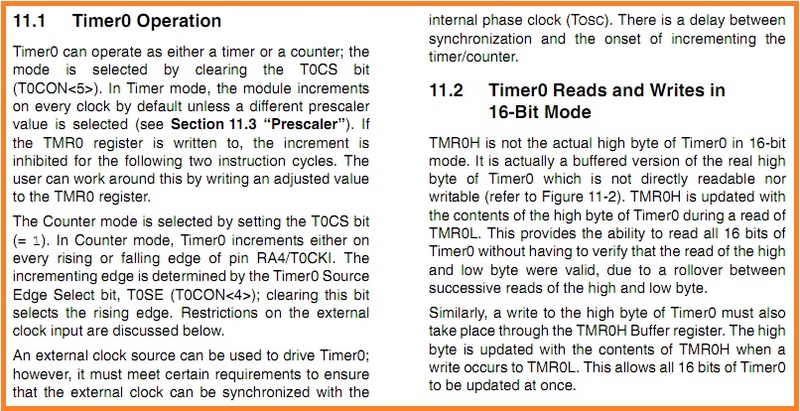 Now we need to take a look about Timer0's control register and some necessary information . Next we will see how timer works and that will be good for us . Read all information carefully provided on these images!! Just keep in your mind , all those given in previous steps.We will need those in source code . Generally We connect crystal clock with microconteroller so that it can work with time. Consider that we are using 12MHz clock. So, that means 12000000 pulses are passing to the microcontroller . Is that clear ? Prescalar is used to measuring frequency. Look at the picture named ratio. When (fosc/4) or (12/4=3MHz) frequency pulse comes to the the microcontroller we need make this smaller to make the calculation easy. So at this stage we need prescalar . Alright! 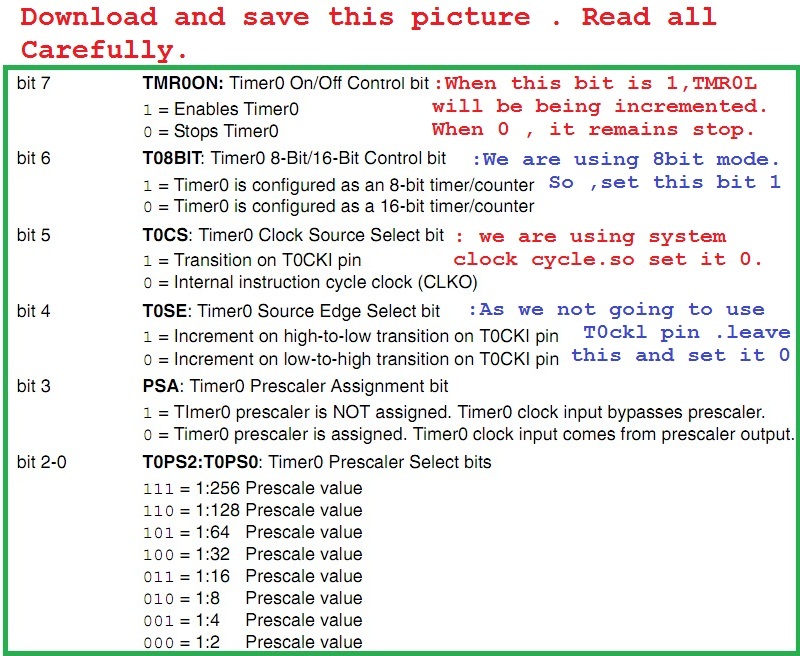 There is another scaler "Postscalar" . Postscalar works after signal has come to the microcontroller .It isn't very necessary in this tutorial. On that picture clock cycle represents (Clock/4) or (12/4=3MHz) frequency . If we use 1:2 to scale , then 2 pulses is considered as 1 pulse . In 1:4 , 4 pulses is considered as one pulse. For 1:8 , eight pulses will be considered as one pulse. Note:To Understand Clearly about Timer0 . You have to keep this picture in your memory . All we see in that part are the details of this Picture and save the Picture . For Clock frequency we could use T0CKL pin (External Source) but Crystal frequency (12 MHz Crystal Clock) is good for us . 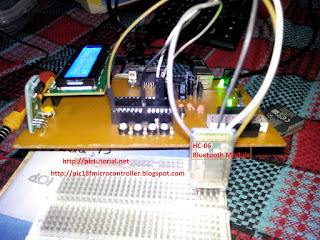 When we connect a crystal (we are using 12MHz Crystal Clock) with our microcontroller , microcotnroller receives pulse continuously. At this case we know the frequency and we can calculate the time period of each pulse from (T=1/f). So if we know how many pulse are received, we can calculate time by multiplying. We will see this later . Generally , Crystal clock frequency divided by 4. It's a rule. That means first time clock frequency prescaled by 4. Look at the picture and you can see that "clock/4" or "System Clock". After this stage signal comes to prescalar. In this tutorial we will use 1:4 prescalar. That means we are dividing the system clock by 4. 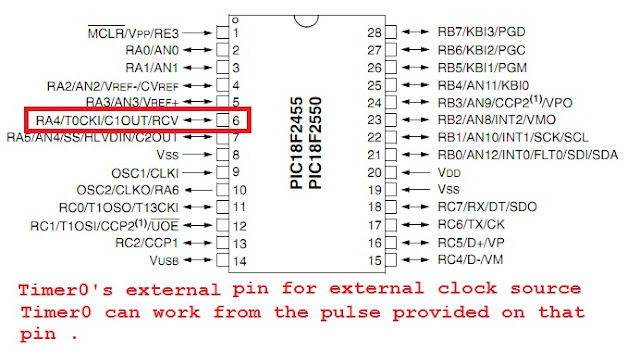 So, it means when 4 system clock pulse comes to prescalar, it sends out 1 pulse to Timer0 register . In this way timer0 register is being incremented . Basically, when one pulse enters into the Timer0 register, TMR0L register is incremented by 1. The capacity of this register is 0 to 255. So when TMR0L will count 255, there will be an overflow interrupt. In the interrupt function routine we will reset TMR0L register and we will increase (int count variable) by 1. We need this variable to remember that how many times interrupt occurred. When we perform [count * TMR0L], we get the total number of pulses. From this information we can measure time of "1" and "0" . Bit 0 to 2 are used to select prescalar. As we are using 1:4 prescalar , we need to set 001 . Now set 3rd bit to 0 . So bit comes 0001. Now set 4th bit to 0 and we get 00001. Now set 5th bit to 0 and we get 000001. Now set 6th bit to 1 , because we are using 8 bit mode . You may use 16bit mode. and we get 1000001. Now set 7th bit to 1, because we need to start timer . Finally we get : 11000001 or 0xc1 (hexadecimal). When overflow happens timer overflow interrupt flag bit becomes 1. 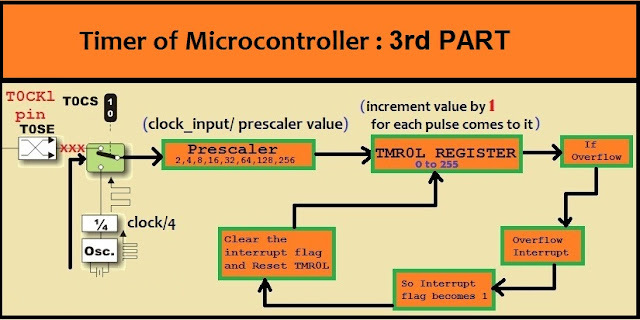 When Overflow Register flag bit becomes 1 and microcontroller understand that interrupt occurred. 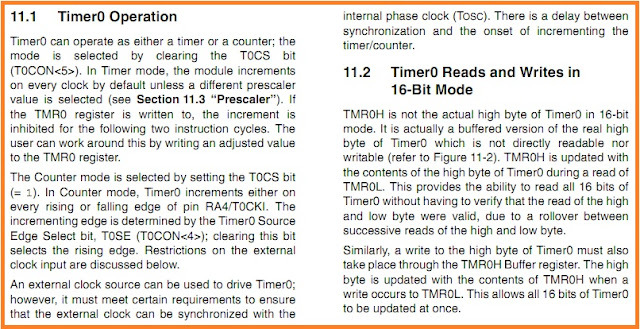 So microcontroller goes to perform timer interrupt routine. When flag becomes 0 , microcontroller understand that everything is fine and there is no interrupt. To enable overflow interrupt we need to set that enable. Unless the overflow interrupt will not work. Note: you can find INTCON register on Interrupt section in Datasheet or in Interrupt tutorial i had described about INTCON register. We set INTCON.TMR0IF bit to 0 and that sets the Flag as 0 .